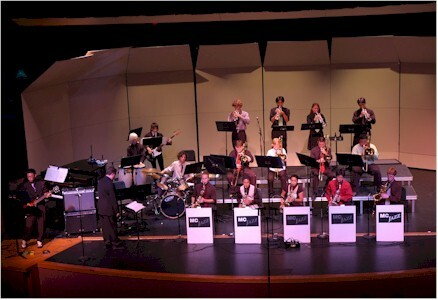 Matt's jazz band was wonderful last night. The concert featured four bands, two from a middle school and two from our high school. Matt's band played last, featuring "Both Hands Swingin" and "Calling Dr. Chops" (both Rob Vuono Jr), "Chicken Scratch" (Kris Berg), "Georgia On My Mind" (Hoagy Carmichael), and "Birdland" (Jpsef Zawinul).